This is one of the features that are on the request roadmap and it's been requested a few more times. In traditional animation Flipping & Rolling are two similar techniques that allow the animator to quickly preview their current animation work by flipping ( jump between the first, last and inbetween drawing of an action) or rolling (preview drawings in ordered sequence flipping with all your available fingers). The "Inbetween" Flipping: This technique is used mostly for the process known as in-betweening and the minimum amount of drawings you can use is two, but 99% of the time you will use three drawings. These are usually, the first drawing in the action (previous key), the last drawing (next key) and the currently edited inbetween. The rolling or "roll flipping" technique is used to check how a specific part of the action is working out, and the minimum amount of drawings are at most 5, one for each finger to manipulate plus one sitting at the bottom of the stack. There's also the "flip" or "stack flipping" technique which is when you take a large amount of drawings, organize them like a giant flipbook and let it "flip" down to check a large portion of your animation at a relative non-real time speed (it's hard to get constant fps using your fingers lol). This could already be considered as partially covered by the playback behavior though. In order to mimic this behavior in a digital environment timeline this functionality should aim to modify the playback behavior as it should be based upon the current drawing / frame container that is being edited, that is, where the playback scrub is located at the moment of activating the function. I have to note this functionality is semantically different from the Range function as well how its applied during a job. 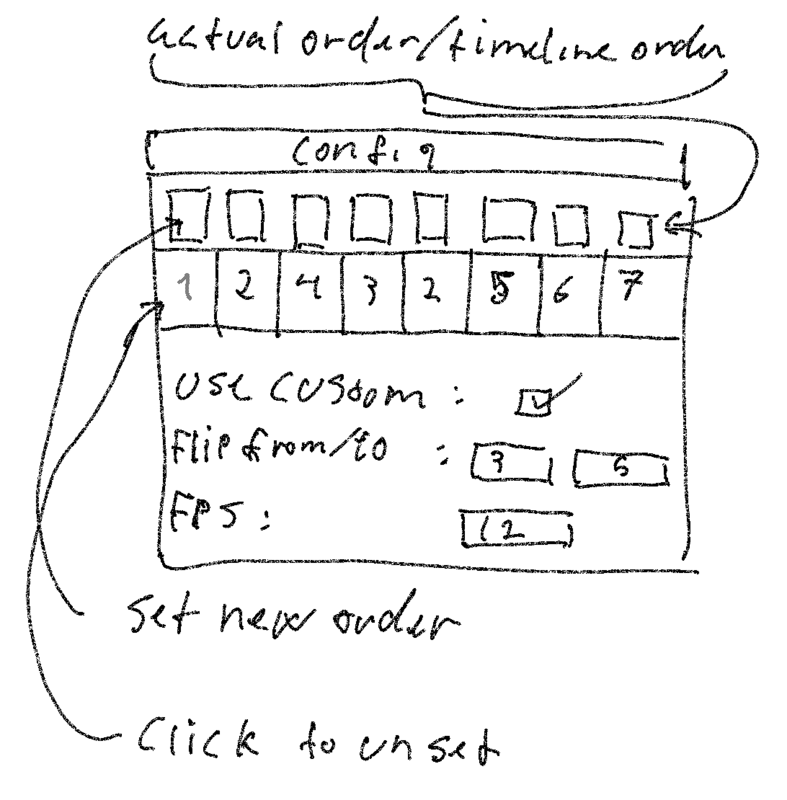 Whereas the current Range function allows you to preview a portion of the timeline from start to end including every frame in the range (in a way this would fulfill the stack flipping technique), the inbetween flipping and roll flipping functions have to behave differently to allow the animator to see the only the drawing(s) (normally keys or main drawings) behind and /or in front but always coming back to the currently edited drawing. Implement a toggled behavior that allows you to playback from and to the currently active drawing / frame container. Implement a toggled behavior that allows you to playback from the beginning of the roll range up to the current drawing. Note: this was implemented similar to the onion skin range where there is a set number of drawings you can playback before the current frame, but it's independent from the frame range feature. 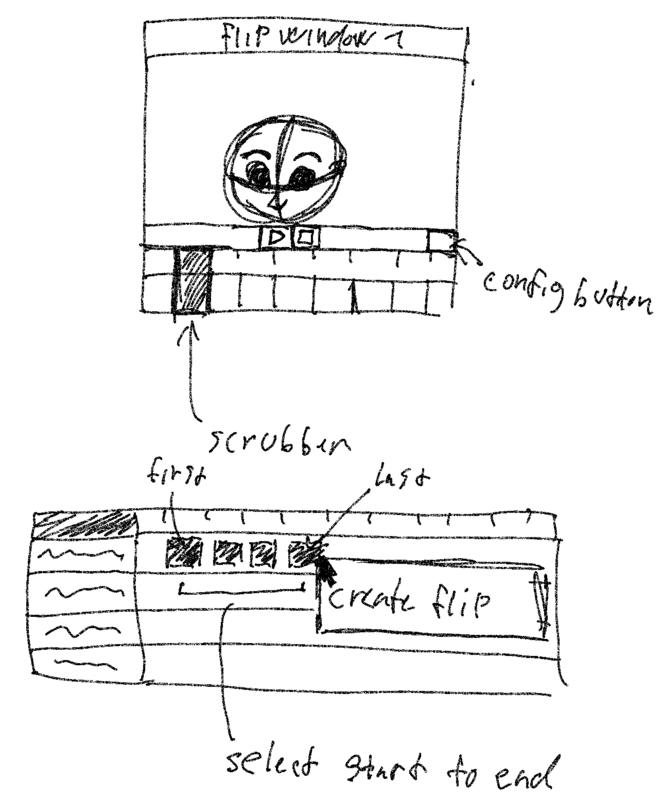 Otherwise we might have to hack the timeline to make it work with this, things such as making the scrubber jump between certain "key" frames with in-betweens could take some work and one would have to toggle it on and off but what if you want both normal playback and flip? This could be an opportunity to make the timeline more dynamic, so we could reuse the base but alter its behaviour depending on what we need it to do. one could alternatively use the keyframe position manager (found in the config window that appears when you create a flip window) shown above to set their custom flip order. if all frames has been removed the timeline is simply empty and the user can choose to close the window. the intent of the window is to preview an animation in a certain way, It should therefore be considered whether it should contain layers. The timeline should be there but take considerable less space than the current timeline. Should be possible to interact with? Again it's a flip/preview window, intended for viewing, it should therefore be considered whether one should be able to modify keyframes here. it's essentially a preview window on steroids. @Jose-Moreno Please test this feature with the nightly build 5 Feb 2019 when you are available. Thanks. @Jose-Moreno Will do. From the commit description there are some requirements that might have been left out, but if needed those can come in a later enhancement. I'll update this issue accordingly as well. thanks again for letting me know. @CandyFace sorry I never really replied to your proposals, at that time I thought they were great. Today @davidlamhauge implementation has been merged and now I think both of us were probably over-thinking this feature a bit too much. Since the flip feature is meant for a quick hands-on preview while your working, getting a different viewer or even abusing the range feature (which I thought it would work as a visual cue), was simply too much. The current implementation is really practical and it works as intended. I've updated the requirements on the original post and although some of the initial ones were fulfilled successfully, I'd like us to discuss the ones remaining marked as "pending discussion". I've put my personal input as a side note on each but depending on what all of you comment, we can consider this fulfilled and close it or wait to implement the remaining tasks in a future enhancement patch tied to this same issue and close it once those are done.